RSMSSB Admit Card 2019: Below are the admit cards published by RSMSSB - Rajasthan Subordinate and Ministerial Service Selection Board / www.rsmssb.rajasthan.gov.in. The recent Admit Card issued for the recruitment drive is Junior Instructor Admit Card 2019. RSMSSB Junior Instructor Admit Card 2019: Rajasthan Subordinate and Ministerial Service Selection Board has issued the Admit Card on 18 Mar 2019 for RSMSSB Junior Instructor Exam 2019. RSMSSB Supervisor (Women) (Anganwadi Worker Quota) Admit Card 2019: Rajasthan Subordinate and Ministerial Service Selection Board has issued the Admit Card on 26 Feb 2019 for RSMSSB Supervisor (Women) (Anganwadi Worker Quota) Exam 2019. RSMSSB Agriculture Supervisor Admit Card 2019: Rajasthan Subordinate and Ministerial Service Selection Board has issued the Admit Card on 26 Feb 2019 for RSMSSB Agriculture Supervisor Exam 2019. RSMSSB NTT Admit Card 2019 (Pre-Primary Teacher): Rajasthan Subordinate and Ministerial Service Selection Board has issued the Admit Card on 19 Feb 2019 for RSMSSB NTTT (Pre-Primary Teacher) Exam 2019. RSMSSB Pharmacist Exam 2018 Postponed: Rajasthan Subordinate and Ministerial Service Selection Board has issued the News on 14 Feb 2019 for the exam. RSMSSB Agriculture Supervisor Admit Card 2019: Rajasthan Subordinate and Ministerial Service Selection Board has issued the Admit Card on 01 Feb 2019 for RSMSSB Agriculture Supervisor Exam 2019. RSMSSB Aganwadi Supervisor Admit Card 2019: Rajasthan Subordinate and Ministerial Service Selection Board has issued the Admit Card on 01 Feb 2019 for RSMSSB Aganwadi Supervisor Exam 2019. RSMSSB Lab Assistant Admit Card 2019: Rajasthan Subordinate and Ministerial Service Selection Board has issued the Admit Card on 25 Jan 2019 for RSMSSB Lab Assistant Exam 2019. RSMSSB Supervisor Admit Card 2018: Rajasthan Subordinate and Ministerial Service Selection Board has issued the Admit Card on 28 Dec 2018 for the exam which is scheduled to be held on 06 Jan 2019. RSMSSB LSA Admit Card & Exam Date 2018: Rajasthan Subordinate and Ministerial Service Selection Board has issued the Admit Card on 09 Oct 2018 for the exam which is scheduled to be held on 21 Oct 2018. RSMSSB Tax Assistant Admit Card 2018: Rajasthan Subordinate and Ministerial Service Selection Board has issued the Admit Card on 08 Oct 2018 for the exam which is scheduled to be held on 14 Oct 2018. RSMSSB IA Typing Test Admit Card 2018: Rajasthan Subordinate and Ministerial Service Selection Board has issued the Admit Card on 29 Sep 2018 for IA Typing Test 2018 which is scheduled to be held on 05 Oct 2018. RSMSSB PTI Admit Card 2018: Rajasthan Subordinate and Ministerial Service Selection Board have issued the Admit Card on 24 Sep 2018 for RSMSSB Physical Training Instructor PTI (Grade III) Exam 2018 which is scheduled to be held on 30 Sep 2018. Click on "Download Admit Card of Direct Recruitment of Physical Training Instructor (PTI) Grade III - 2018" and then click on "Get Admit Card"
Enter your "Application No. ", DOB and Captcha for downloading your admit card. RSMSSB LDC/ JA Admit Card 2018: Rajasthan Subordinate and Ministerial Service Selection Board has issued the Admit Card on 08 Sep 2018 for the exam. RSMSSB Clerk Grade II & Junior Assistant Admit Card 2018: Rajasthan Subordinate and Ministerial Service Selection Board has issued the Admit Card on 01 Sep 2018 for Clerk Grade II & Junior Assistant Exam 2018 which is scheduled to be held on 09 Sep 2018. RSMSSB LDC Admit Card 2018: Rajasthan Subordinate and Ministerial Service Selection Board has issued the Admit Card on 03 Aug 2018 at 5 PM for the exam which is scheduled to be held on 12 Aug 2018. RSMSSB Informatics Assistant IA Admit Card 2018: Rajasthan Subordinate and Ministerial Service Selection Board has issued the Admit Card on 05 May 2018 for Informatics Assistant IA Exam 2018 which is scheduled to be held on 12 May 2018. RSMSSB Sanganak Admit Card 2018 (Computor): Rajasthan Subordinate and Ministerial Service Selection Board has issued the Admit Card on 28 Apr 2018 for Sanganak Exam 2018 which is scheduled to be held on 05 May 2018. RSMSSB Lab Assistant Result & Document verification Dates: The board has announced the result for the Lab Assistant recruitment exam, the examination was conducted on 13.11.2016 and first result was declared on 14.08.2017 and revised result was published on 24.08.2017 for the same. 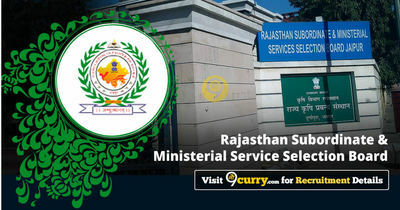 Today Rajasthan Subordinate and Ministerial Service Selection Board has published the roll no. along with date for document verification. For your document verification date click on following link.